They say that home is where the heart is. Memories, traditions, tears and laughter. The things that hold the most value don’t require cardboard boxes and rolls of messy packing tape. Cherishing the intangible keepsakes never results in back pain or anxiety-ridden sleepless nights. When the time comes to organize, declutter and move out of a 2,000 square-foot home and downsize into a 700 square-foot one-bedroom apartment, one might quickly face the ugly truth that home is where the stuff is. Moving is rated among the top five most stressful life events, right below divorce, and right above experiencing a major illness. The process can be overwhelming, especially for someone over the age of 65 who has possibly inhabited the same home for decades, likely adding more furniture, clothes and décor over the years. 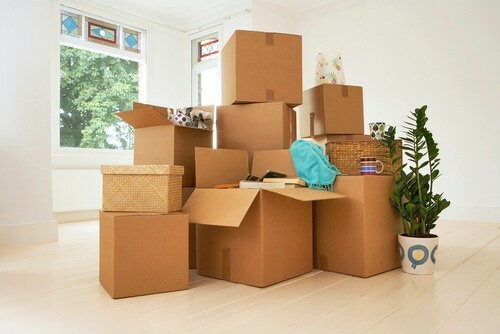 Rooms, closets and garages are full, and the mere thought of moving creates stress. Stress is a normal part of life, but in older adults, it can be dangerous. With aging cells, the body is less able to adapt. 80% of older adults suffer from at least one chronic illness, which makes it more difficult to cope with stress and bounce back to normal life. Relocation Stress Syndrome (RSS) is as real as the “for sale” sign in your front yard. It’s sometimes referred to as transfer trauma. RSS is a diagnosis defined by symptoms such as: confusion, anxiety, hopelessness and loneliness, usually occurring in older adults after moving from a private home into an Assisted Living Facility or Skilled Nursing Facility. “Why not avoid the stress altogether by staying home?” you may be asking. Most older Americans don’t make the move frivolously. Home maintenance becomes a heavy burden, loneliness sets in, assistance with Activities of Daily Living is needed, the feeling of safety and security within the home is lost, or an unexpected illness or hospital stay thrusts one into a new environment with little to no preparation. However, aging in place may be feasible for some with the proper caregiver and/or agency, but it is not the best, safest fit for all, causing the need to (deep breath)… move. SENIOR MOVE MANAGERS TO THE RESCUE! Senior Move Managers (SMM) are experienced professionals who recognize and understand the effects a move can have on a senior; therefore, they assist older adults and their families with the numerous physical and emotional aspects of transitioning and relocating. The National Association of Senior Move Managers (NASMM) was founded in 2002 by several passionate moving professionals, and today it is composed of over 900 Senior Move Management companies! The NASMM developed the only organizational accreditation program in the industry, NASMM A+ Accreditation. By seeking a SMM with this accreditation, families can feel confident that their moving organization functions at the highest standard. Why hire a Certified Senior Move Manager? Trust: NASMM sets high ethical standards to protect clients and families. All members must complete and pass training courses in ethics and accountability and sign and abide by their code of ethics. Education: Members of the NASMM are encouraged to enroll in continuing education courses via conferences and study materials. Long Distance: Eases complications associated with moving out of state by creating trust in hiring a SMM in one state to pack and load and a different SMM in the destination state to complete the job. Visit nasmm.org to search for a Senior Move Manager in your area(s). Some Senior Move Managers, like Joanna Spornhauer, owner of Transitional Care Movers (TCM) in The Villages, Florida, complete a transition from A to Z. This includes sorting, packing, moving, unpacking, and decorating the new space to be “move-in ready.” Wow! Joanna says that clients can relax while simply pointing to items for the TCM team to sort and pack. If lifting a finger to point doesn’t cause stress, then consider this top-of-the-line move package to be stress free. TCM offers other moving packages at a range of prices for those who may elect to sort and pack while only needing a Senior Move Manager for physical moving and unpacking. The options are endless. What about all the extra stuff? Find someone like Joanna of TCM who has done the research to understand floorplan options at local Senior Living Communities, so she’s aware of what will fit and what won’t. Her honesty, mixed with compassion, is best for those who might have a hard time parting with pieces like that antique solid-wood dining table that could fill an entire bedroom. Moving from a private home into a Senior Living Community likely means there will be furniture and décor that just doesn’t fit. If you or your loved one expects to have excess, consider hiring a SMM that also specializes in estate sales. Start organizing small closets first and move wanted items to a master closest. Get rid of anything you don’t want. Compare moving organizations’ fees. Be aware of hourly fees, as movers may take longer than necessary to complete the job. Flat rates are more predictable. Start downsizing earlier rather than later! Don’t wait until an accident occurs that may leave you in the hospital and your family left to sort your belongings. Visit Senior Living Communities (Independent Living and Assisted Living) to inquire about their floorplans, moving services and transition procedures (i.e. Does the Marketing Director introduce you to all directors and current residents with similar interests? Making friends prior to moving into a community helps ease the transition). Don’t do it alone! Ask a family member, friend, Senior Move Manager or Senior Living Community Administrator for help. Keep in touch with the latest Wright’s news, photos and more!